In May, Chris Bray (then 24) and Clark Carter (then 23), both from Sydney, began hauling, paddling and dragging 500kgs of equipment and supplies behind them in unique carts they designed and built themselves. Their mission: to cross 700kms of snow, frozen lakes, mud plains, boulder fields, tundra, endless jagged ice, shattered rock and even rapids. 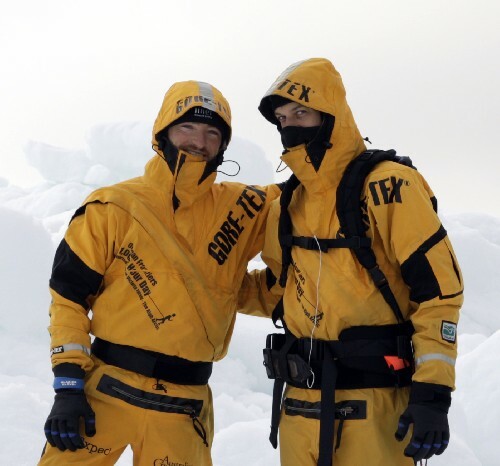 Their remarkable journey is a world first, with the duo passing through regions that have likely never before been seen by human eyes. Overcoming countless setbacks, the pair encountered arctic wolves and polar bears, and were forced to make do with what limited resources they had to repair and even re-build their carts along the way. But that�s what makes it an adventure. Come and hear Chris and Clark recount their amazing adventure for one night only in your city. SYDNEY: Wednesday 22 October, Teachers Federation Auditorium Reservoir st Surry Hills. (Brand new 400 seat auditorium - CLICK HERE for to show location on a MAP - it's right near Central station.) Screening starts at 7pm sharp. BRISBANE: Tuesday 28 October, Lecture Theatre 100 Wickham st Fortitude Valley. Screening starts at 7pm sharp. MELBOURNE: Wednesday 29 October, Casey Plaza, RMIT (Bowen Street enter from LaTrobe Street in Melbourne CBD). Screening starts at 7pm sharp. BOOK YOUR TICKETS NOW AT www.PaddyPallin.com. Our live expedition updates are written on our tiny ASUS Eee PC 900 laptops, and sent via Iridium 9505A satellite phones from Landwide Satellite Solutions, using email compression software xGate from Global mareine Networks! Thanks guys - it's the perfect set up! I can put you up, I have lots of tents, only kidding. Love to see you in Perth. Give us a bit of notice and we could book a Hills camp site in Lesmurdie. Sit around a fire and tell stories. Accross the road, an open air theatre. Tempted? You deserve it. You have entertained us! congratulations on your amazing feat(s)! and on being honest and precise about it. cant wait to hear about your next adventure! How about a visit to Adelaide? What does the entry fee of the presentation go towards? Damn, missed the one in Sydney. Will there be a podcast of the lecture at any point? , “For every mark issued, we reueriqd the equivalent of a mark’s worth of work done, or goods produced.” The government paid workers in Certificates. Workers spent those Certificates on other goods and services, thus creating more jobs for more people. In this way the German people climbed out of the crushing debt imposed on them by the international bankers.Within two years, the unemployment problem in Germany had been solved, and Germany was back on its feet. It had a solid, stable currency, with no debt, and no inflation, at a time when millions of people in the United States and other Western countries controlled by international bankers were still out of work. Within five years, Germany went from the poorest nation in Europe to the richest.Germany even managed to restore foreign trade, despite the international bankers’ denial of foreign credit to Germany, and despite the global boycott. Germany succeeded in this by exchanging equipment and commodities directly with other countries, using a barter system that cut the private bankers out of the picture. Germany flourished, since barter eliminates national debt and trade deficits. Today Venezuela does the same thing today when it trades oil for commodities, plus medical help, and so on. wrote.. The pub dining table ktehcin furniture is a incredibly essential and attractive item for the interior decoration. Unlike traditional, sizeable dining tables, pub table furniture is smaller, and will take up less space. When you are looking for an option dining alternative, or some thing to use after you don't feel like using your formal dining room, pub table furniture is usually a superb notion. The first factor you have to consider when purchasing it is actually the actual size with the room you're going to be putting it in. We email out notifications the instant we upload any news items of significant interest, so if you'd like to follow our adventure more closely, then why not add your email addr to our list of friends? You can remove it anytime you like. Your comments will be emailed to us. receive an email alert if we post a reply to your comment. this same news item or its comments (including yours!). This email will contain an auto-unsubscribe link. Alert me about new comments. Click here to send an email to a friend telling them about this site.